A medley of bacon, sausage, ham, and a three cheese blend. Topped with gravy. Scrambled eggs with chorizo, avocado, tomatoes and spinach. Wrapped in a spinach tortilla and topped with salsa, combo cheese, sour cream & chives. Scimeca's Chorizo, onion, green chilies, avacado and a combination of Jack & Cheddar cheese. Topped with sour cream and served with salsa on the side. Pork Carnita, onions, jalapenos and tomatoes wrapped in a tortilla. Topped with Jack cheese and house made chipotle sauce. Scrambled eggs, flour tortilla, sausage, bacon, onion, black beans, combo cheese, tomatoes, jalapeños. Served with salsa and sour cream on the side. Served with sausage gravy, potatoes, and biscuit. Three-egg omelets, served with toast and potatoes. Scimeca's Andouille sausage, peppers, onions, and Jack cheese. Bacon, sausage, ham, onions, tomatoes, mushrooms topped with cheese, sour cream and chives. Scimeca's Italian sausage, spinach, roasted red peppers, mushroom, and jack cheese. Smoked salmon, cream cheese, tomatoes, onions, and hollandaise. Bacon, tomatoes, and avocado, topped with Jack cheese, sour cream and chives. Served with side of salsa. Peppers, mushrooms, fresh asparagus, onions, Jack cheese served with a side of hollandaise and a cup of fruit. Smoked brisket, onions, mushrooms and Jack cheese. All of the pancakes we serve are made from scratch in our kitchen. You're more than welcome to eat pancakes from a mix...just not here. Thick egg bread dipped in Mom's secret batter. 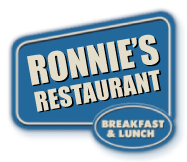 Ronnie cleans his plate every time. We know you will, too. Topped with butter and powdered sugar. Two pieces of our French toast filled with sausage, melted cheese, and scrambled eggs. Our French toast topped with warm caramel sauce, fresh banana slices, and pecans. Two pieces of Cinnamon Roll French Toast served with two eggs and your choice of meat. Topped with warm peanut butter and bananas, powdered sugar and butter. Waffles served with two eggs and a choice of meat. This delightful dessert is made fresh each morning. Topped with warm icing, these are great with your meal or to go!